One important thing I should mention about my experience with Mass Effect 3 is my propensity to glitches. The isn’t the fault of the game itself, as it was usually very reliable. However, I do have a tendency to accidentally cause bugs and glitches in most games I’m playing, even when other people playing it don’t experience these bugs. When playing ME3, this ability is increased to weird levels. (It’s because of this game that my Xbox tagline is now “the accidental glitcher”). So I couldn’t really write about ME3 without explaining some of the strange things that have happened to me while playing it. 1) I’ll start with the most minor glitch. At the start of each wave, the enemies will appear from certain locations, depending on where the team members are. Normally, you don’t see them spawn- at least, most of the people I play with say that. However, I always end up right by where they spawn. Seeing as they usually appear by flying/jumping down from a point above the map, that means I’ve occasionally had enemies jump down almost on top of me, which isn’t supposed to happen. 2) Another minor glitch is an unfortunate consequence of a useful part of the gameplay. Some multiplayer classes have stimpacks or temporary skill boosts that are accompanied by visual effects. For example, human Soldiers have Adrenaline Rush, which increases rate of weapon fire and damage, and when this is active everything is brighter and colours are more saturated. Another effect is on Krogan characters, whose Rage mode tints the screen red to show their increased attack damage. While these effects add a visual extra to the game, they are often inconsistent- sometimes the skill can be active without the visual effect activating, and other times the visual effect will remain even when the power isn’t active. Normally, these don’t cause too much bother: the only one of these that I’ve found annoying is the visual glitch caused by some of my favourite characters, the Volus species. Voluses (Volii?) have incredibly low health and shields (150 health/ 250 shields as opposed to a default 500/500), so rarely survive a direct fight. However, they excel in a pure support role, relying on their Shield Boost ability to refill their own shields and those of nearby fireteam members. The “Volus glitch” comes from using this ability just as you’re about to die. At very low health the screen goes dark red as a warning, but using Shield Boost to recover your health often locks the screen onto this colour, which can only be fixed by losing health and shields again. This means it’s a lot more difficult to see what’s going on, which has caused me to die unnecessarily before. 3) One common glitch which does affect gameplay is known as the “Vanguard glitch”, as it is caused by the Biotic Charge skill common in Vanguard-type characters. 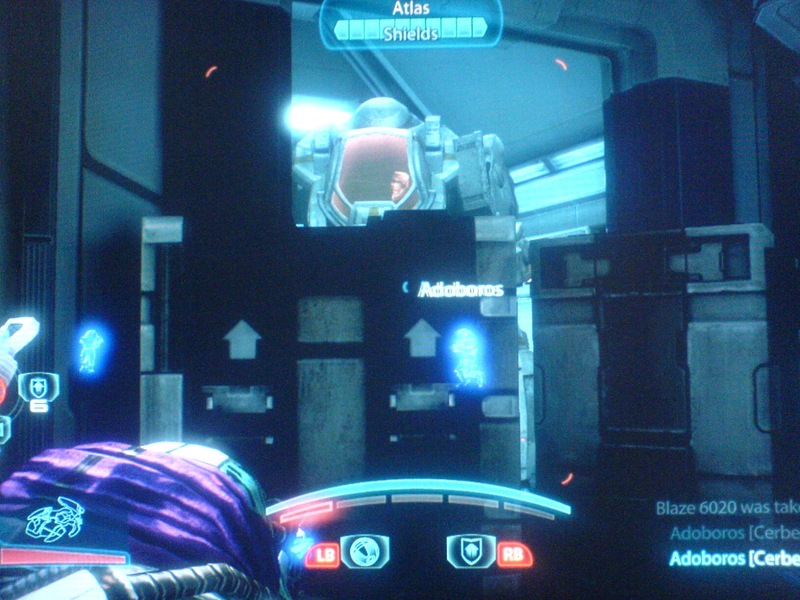 Biotic Charge locks onto an enemy and teleports the player forcefully into them for high damage. As this teleport ability can cover long distances such as across entire maps, it can cause a lot of problems within multiplayer matches. When unlucky vanguards tried to teleport across the map, they would often find themselves flying upwards instead: sometimes this would take them so far upwards that they would be beyond the boundaries of the map. I’ve been quite lucky and only got this glitch twice- however, I managed to do this spectacularly by taking some of the enemies up with me as well, which doesn’t happen often. It turns out that an Atlas tank stranded on a roof is very difficult to take down! 4) Knowing that Voluses are glitchy characters and that Vanguards are glitchy characters, you would assume that a Volus Vanguard would be even more so. Which is exactly what I found when I tried to use one. Firstly, I was using this character in a match with friends when I got executed (instantly killed without being revivable) in one round. A few minutes later I looked back at my screen, to see my impending death. Assuming we had moved on to the next round and that I wasn’t paying attention, I started playing again but was downed shortly after. When I asked to be revived, everyone got confused and said that I had already been killed. It turned out that I had somehow been resurrected (which I’ve never seen happen before or since) and was invisible to everyone else on my team- when they switched to my screen view, I was trapped in a black void, but on my screen I was taking part in the game. That remains the second-weirdest game I’ve ever played- if I had been playing as a stronger character I could have used it to my advantage, but being a Volus meant I died a lot, and no-one could find my character to revive me. 5b) Finally, the strangest match I’ve ever played. One of the original maps got patched by Bioware after a few months, making one room inaccessible to prevent people camping in there. About a month ago, almost a year after this room was locked out, I was playing as the Volus Vanguard, standing next to the blocked entrance when I got executed. When the next round started, I was inside the locked room, with no way out. As you can tell from the picture, I was still in play, and could still attack a few enemies. However, because the Volus is such a short character, there wasn’t much I could do beyond this. It also meant I couldn’t properly finish the match, as I couldn’t get out of the room to reach the final zone. For the rest of the match, all I could do was use my Shield Boost ability to heal my team-mates every time they walked past me. Having said that, it was still a fun match, if not just because of how weird the situation was. So know you know just how much I glitch the games I play, let me know if you do the same.